As part of our on-going commitment to reach as many London based SMEs as possible with our loans for small business, Fair Business Loans joined the National Association of Finance Brokers (NACFB) as a patron last September to help develop introducer relationships. The NACFB is the trade body for brokers of business loans UK. As obtaining funding for small businesses has become more challenging, the advantages of using a broker to help fund businesses has become more important than ever and this has been recognised at the highest level. The NACFB is engaged with Government and HM Treasury in sourcing alternative forms of finance. Last Wednesday, Rob and Mike from the Fair Business Loans team attended a breakfast meeting at the Gatwick Crowne Plaza Hotel to spread the good word about our mission to save small businesses from high-cost lenders and financial exclusion. 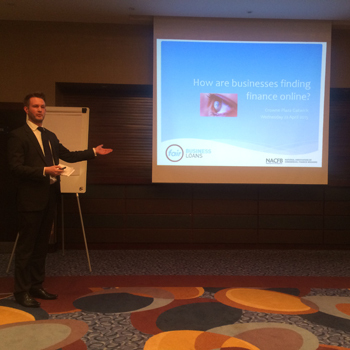 This involved a 10 minute presentation highlighting exactly what it is we do and who we are looking to support, while also serving as an educational piece - highlighting the difficulties faced by businesses when trying to source business finance by themselves online. The event was well attended by both lenders and introducers from across the business finance spectrum – from short term unsecured lenders to commercial mortgage and bridging loan specialists. We were able to engage with influential partners who we are confident will consider us a viable option when advising London based clients with small funding requirements. We hope to continue attracting new introducers to our broker panel in the coming months to ensure we are supporting as many businesses as we can. We will shortly be launching a dedicated introducer section to our website which will enable partners to find out more about what we offer and register to join our introducer programme.